John Pitchford was born on May 29, 1927, in Natchez, Mississippi. He enlisted in the U.S. Army Air Forces on August 23, 1944, and served as an airplane and engine mechanic until receiving an honorable discharge on December 22, 1946. Pitchford served as an infantryman in the U.S. Army Reserve while in college, from November 8, 1949, to February 13, 1951, and he was commissioned a 2d Lt in the U.S. Air Force through the Air Force ROTC program at Louisiana State University on May 26, 1952. Lt Pitchford went on active duty beginning August 11, 1952, and then completed flight training, receiving his pilot wings at James Connally AFB, Texas, in September 1953. After completing F-84 Thunderjet Combat Crew Training, he was assigned to the 8th Fighter Bomber Squadron at Misawa AB, Japan, from March 1954 to March 1956, followed by service as a gunnery instructor pilot at Luke AFB, Arizona, from March 1956 to January 1963. 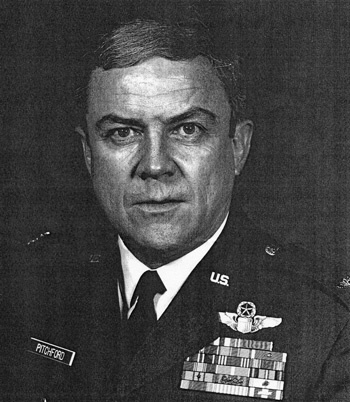 Capt Pitchford served as air operations officer with Detachment 2 of the 39th Air Division at Osan and Kunsan AB, South Korea, from January 1963 to March 1964, and then served as air operations officer for the 27th Tactical Fighter Wing at Cannon AFB, New Mexico, from March 1964 to September 1965. His next assignment was as an F-100 Super Sabre pilot with the 524th Tactical Fighter Squadron at Cannon AFB from September to November 1965, followed by service as a Wild Weasel pilot flying the F-100F with the 6234th Tactical Fighter Wing at Korat Royal Thai AFB, Thailand, from November 1965 until he was forced to eject over North Vietnam and was taken as a Prisoner of War on December 20, 1965. He was the first Wild Weasel pilot shot down during the Vietnam War. After spending 2,612 days in captivity, Col Pitchford was released during Operation Homecoming on February 12, 1973. He retired from the Air Force at Kelly AFB, Texas, on July 19, 1977. John Pitchford died on December 2, 2009, and was buried at the Natchez City Cemetery in Natchez, Mississippi. 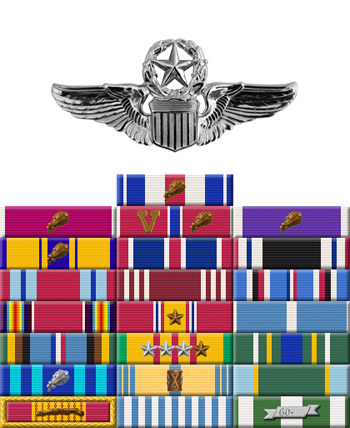 Captain John J. Pitchford distinguished himself by gallantry in connection with military operations against an opposing armed force over North Vietnam on 20 December 1965. On that date, Captain Pitchford was tasked to search out and destroy Surface-to-Air Missile emplacements which would menace a main force strike against a vital bridge complex deep within North Vietnam. Courageously pressing his attack through a hail of antiaircraft fire which disabled his aircraft, Captain Pitchford determinedly and selflessly swept through hostile defenses to drop his bombs squarely on target. By his gallantry and devotion to duty, Captain Pitchford has reflected great credit upon himself and the United States Air Force.